"'The idea that all violence is "senseless" violence is one that has taken deep root on the left; it’s also, unfortunately, one that poses a major impediment to understanding the world. "So, because there was organization behind the murder of six million Jews, it made sense? Or is it because it made sense to some people, the Holocaust wasn’t senseless? Yeah, my head is spinning too. If, as a country, we can agree upon one thing, let’s please agree that the attempted extermination of a large portion of the population makes no sense. Those who did follow the Nazi party, generally did so out of fear – not fear of the people who were trying to conquer all of Europe – fear of people who had very little, if any impact on their lives. That is misguided. That is deluded. That is dangerous. That is senseless. "Often, when we think of the National Review, we think of a slightly elevated level of wing-nuttery. It was founded in 1955 by William F. Buckley, a traditional blue-blooded, Ivy League educated conservative. He was regarded as an intellectual, and might have been chided for that reputation if he had lived long past George W. Bush’s inauguration – an administration which ushered in the age of Republican anti-intellectualism. However, Buckley and the National Review, as highbrow as they like to imagine themselves, are largely responsible for today’s Republicans. In 1955, Buckley didn’t like the direction his party was going. 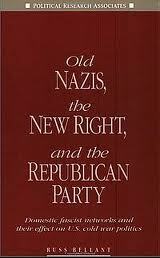 At the time, the Republican party was the party of Eisenhower. It was a party of peace. Through the National Review, Buckley provided the intellectual voice for war mongers and white supremacists. "While on the surface, it might seem that the NRO’s criticism of Obama’s reference to Nazi Germany was just another jab at their favorite Democratic punching bag, it could be much more. For the National Review, it’s likely that the Holocaust did in fact make a lot of sense." "Are Republicans like George H. W. Bush, Oliver North, and Jesse Helms, aware they have been assisted by Nazi collaborators? Bush once worked for the CIA and should have known about the nature of the Nazis in his '88 campaign. No doubt he knows the history of Nazi/CIA collaboration. Whether or not Bush knew of the fascists' involvement in his campaign, the Republican Party should have done a far better screening job. One thing is certain: The intelligence agencies know the scope and extent of Nazi involvement with the political right in this country. It is a shame they keep it hidden from the majority of the American people. "Two months before the November 1988 presidential election, a small newspaper, Washington Jewish Week, disclosed that a coalition for the Bush campaign included a number of outspoken Nazis and anti-Semites. The article prompted six leaders of Bush's coalition to resign. 1. Radi Slavoff, GOP Heritage Council's executive director, and head of "Bulgarians for Bush." Slavoff was a member of a Bulgarian fascist group, and he put together an event in Washington honoring Holocaust denier, Austin App. 2. Florian Galdau, director of GOP outreach efforts among Romanians, and head of "Romanians for Bush." Galdau was once an Iron Guard recruiter, and he defended convicted Nazi war criminal Valerian Trifa. 5. Walter Melianovich, head of the GOP's Byelorussian unit. Melianovich worked closely with many Nazi groups. 6. Bohdan Fedorak, leader of "Ukrainians for Bush." Fedorak headed a Nazi group involved in anti-Jewish wartime pogroms. The Philadelphia Inquirer ran an article on the Bush team's inclusion of Nazis (David Lee Preston, "Fired Bush backer one of several with possible Nazi links," September 10, 1988.) 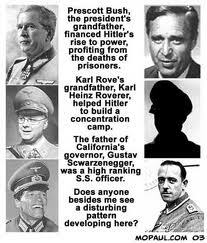 The newspaper also ran an investigative series on Nazi members of the Bush coalition. 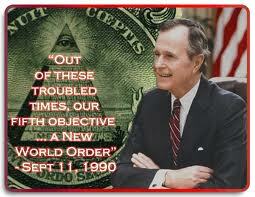 The article confirmed that the Bush team included members listed by Russ Bellant." "Before the election last November, a Frenchman (immigrant) who was canvassing for Barack Obama saw me in my yard working, and came over to ask me to vote for Obama. We got to talking about France, and I asked him if France had conservatives? "His candor was refreshing, to say the least. But there are indeed some similarities between the right wing of the GOP, and the most reprehensible regime ever inflicted on mankind, Hitler and his Nazi rat henchmen. "1. The general feeling, whether spoken out right, or kept not-so-subtly-hidden, of being better than others. 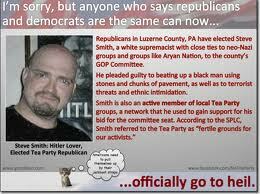 Nazis, like Republicans, and Republicans, like Nazis, think they’re better. They’re white. They don’t like, not necessarily in this order of dislike, niggers, spics, gooks, zips (Koreans), dinks (Chinese), wops, Jew kikes, Japs, wet-back greasers, camel-jockeys and sand niggers (A-rabs), Frogs, foreigners, immigrants, faggots and butch lesbians, and a host of others. Republicans often talk about (white) Americans as though they’re God’s chosen people, the only people who matter (in the war in Iraq, no mention has ever been made of the number of Iraqis killed because they don’t matter). The Nazis of course called themselves the Master Race. "2. Religious Xenophobia. God is a Republican. The Republicans tie religious belief to their supposed superiority, and to politics and policy-setting. They know God. You don’t. God favors them, not you, if you disagree with them. The German Nazis had belt buckles that read, 'Gott Mitt Uns' (God is with us). "3. Patriotism as propaganda. 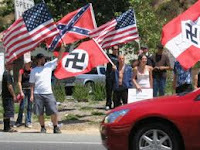 Republicans consistently and improperly display the flag, often from car antennas, to demonstrate their patriotic resolve, when the flag was meant to be displayed properly, only in places where decorum would allow dignity. The flag was not meant to be a feckless political prop to back a right wing world viewpoint. For their part, the German Nazis had rallies with thousands of flags. "4. Love of war. The Republicans used to pride themselves as the party that didn’t start wars, the Democrats did. No more. Today, they never saw a war they didn’t like (they won’t admit it), and view war not as a purely defensive measure as the Founding Fathers intended, but as a useful tool, an instrument of shaping foreign policy. The German Nazis use of war is well known to the world. "5. Love of radio propaganda. Political talk radio is a largely right-wing creation, to counter what conservatives endlessly contend is the liberally biased mainstream media, and has mushroomed across the country, fed by angry white boys who like to listen to it. It is hosted by a host of American Joseph Goebbels (German minister of propaganda) imitators, who dispense false accusations, right-wing claptrap and mocking, thinly-disguised hate for those who disagree with them. Their most recognizable traits are smugness and the school-yard bully mean spirit. "6. The cult of the leader (fuehrer). Democrats may praise the tough pluck of little Harry Truman, or the dignified wisdom of FDR, but mythologizing conservatives as some kind of gods brought down from on-high is a right-wing phenomenon that has recently grown in scope. Current deification efforts include among others, Ronald Reagan, John Wayne and the pre-posthumous Rush Limbaugh. The Germans of course had Hitler. "7. Use of diversions. The Germans used the Reichstag fire of 1933 to suspend civil liberties under emergency decree. George W. Bush used 9-11 to invade Iraq under the guise of false weapons of mass destruction, and to re-make the Middle East. He did illegal wire taps of American citizens to make Americans supposedly safer. Both German and American citizens largely accepted these measures with docility and without debate or protest. "9. Contempt for Democracy. 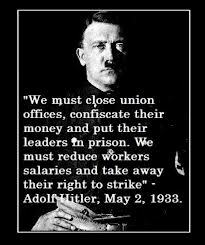 Hitler said Democracy was corrupt, soft. Bush said being a dictator would be easier than being president. "10. The blame game, or denial of bad news. Conservatives, in power for eight years, blame Obama for the country’s impending economic collapse. Hitler said his generals let him down." "As Chancellor of Germany, Adolph Hitler quickly eliminated his government partners and took control. The rise of Hitler came rather easily due to the financial crisis of World War I and the Treaty of Versailles, which cost them more money than the country had, then the Great Depression kicked in and the poor were desperate for a solution. Adolph Hitler quickly took control of the situation and began to 'create' an enemy to divide and conquer . The Jews became the enemy and the Germans became his 'grateful' subjects. "The Nazis promised national and cultural renewal. The middle-class political parties lost supporters that took to the extreme right wings of their conservative party. In 1934, when Hitler gained control, he disbanded federal state parliaments; local government was also deposed of governors and mayors of all towns and cities with less than 100,000 people. "Hitler used fear to dominate and control the people of Germany. In an interview in 1934 with a British paper he said, 'I tell you that the Nazi movement will go on for 1,000 years! Don't forget how people laughed at me, 15 years ago, when I declared that one day I would govern Germany. They laugh now, just as foolishly, when I declare that I shall remain in power.' He remained in power for another decade." Conservative sheeplets have attacked President Obama for being a Nazi, a socialist, and a Muslim, three rather incongruous groups, and few bother to link up the Conservative goal of government and corporations acting as partners. 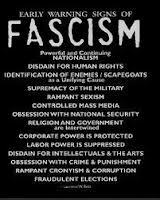 Even fewer will bother to read down this far, but if they did they might be surprised to find out what the philosophic roots of fascism really are --> http://en.wikipedia.org/wiki/Fascism. But we should take our lead from Germany by banning Conservatism, just as post-World War II banned Nazism and Fascism in their efforts of "Denazify" Germany. 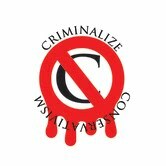 See http://en.wikipedia.org/wiki/Denazification, for strategies to criminalize Conservatism in America. "Tradition wears a snowy beard, romance is always young."